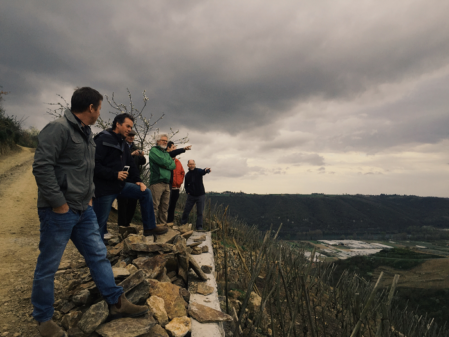 It had been years since I’d been in the northern Rhone and unexpectedly I was invited to go on a trip in April 2016 with a group of California winemakers plus a consumer and a San Francisco wine bar owner. Our trip centered on the northern Rhone appellations of Condrieu, Cote-Rotie, Hermitage, Crozes-Hermitage, Sainte-Joseph, and Cornas. In this region the red wine is Syrah and the whites are Viognier, Marsanne and Roussanne. Paul Gordon of Halcon Vineyard in the coastal Mendocino Ridge appellation persuaded John Livingstone-Learmonth, the English wine writer whose specialty is all things Rhone to lead the trip. For those that don’t know of him, John has been visiting and studying the Rhone since the 1970’s and has done so because of a passionate obsession to do his part to preserve the traditional wines of the area which are unique and precious. He has written quite a few encyclopedic books about the subject and they are essential reading for anyone seriously interested in the Rhone. John planned two visits per day with half the time spent in the vineyards and the other half in the cellars. These were fun filled days starting at 8am for a quick breakfast, the morning visit at 9am in the vineyard, then finishing in the cellar around 1pm. Then followed a quick vineyard picnic, and then on to the afternoon visit that often lasted until 7pm. Dinner was at 8:15 at one of the local Tain-l’Hermitage restaurants, where we sampled lots more northern Rhone wine. Tasting close to 100 wines a day, it was joyful work for a wine geek like me. We did this for four days and on the fifth we met for a tasting where we California winemakers presented our wines to many of the producers we had visited, and then had a fabulous lunch afterwards. 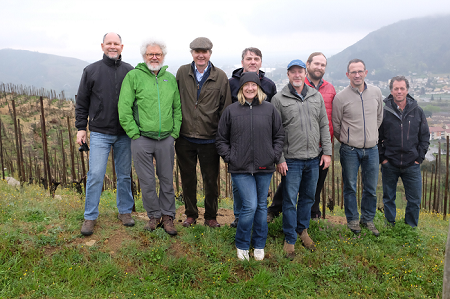 We visited Domaine Clusel-Roch, Jean-Paul and Corinne Jamet in Cote-Rotie, Andre Perret of Condrieu, Pierre and Jean Gonon of Saint-Joseph, Marc Sorrel and Cave de Tain in Hermitage, and Domaine Auguste Clape and Thierry Allemand in Cornas, and it was wonderful to see their different styles and points of view. We visited only relatively small wineries, places that were roughly equivalent in size to our own operations–with the one exception being the Cave du Tain, the co-op winery in Tain-l’Hermitage that has an amazingly sophisticated operation and a smart administration. From each producer we visited I found wines of great interest. I love to hike, and presented a hill to climb, I am always ready to go, so on the day of my arrival I walked up and around Hermitage hill. What struck me was that the hillside vineyards (steep hills!) are an extraordinary amount of work to maintain. 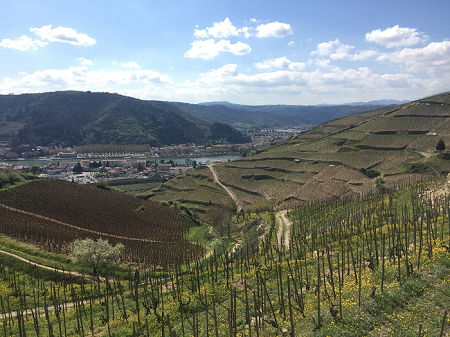 These hillside sites make the best wines, but no matter the price of the wine, it clearly is an economically risky proposition. Unless you have been involved in an agricultural enterprise I’m not sure you could grasp just how much work it is to farm these plots, it’s just nuts! Virtually everything is done by hand. And add to that the growers that have eschewed chemical farming, and you get the feeling that the work must be near impossible to accomplish, and yet that’s what makes the wines from these sites so astonishing. There did seem to be a great divide between those that saw herbicides and pesticides as a godsend of convenience, and those that felt that those chemicals were taking the life out of the soil and the wines. When I was there, which was just at bud break, it was eerie to see the naked earth of herbicided vines side by side with ones grown organically that were full of life, covered with flowers and weeds. Wine is a very personal thing, and I must say that I love Rhone wines, having first discovered them at Kermit Lynch in Berkeley, California in the late 1970’s. I’ve remained intrigued by them ever since. Many northern Rhone red wines are rustic, but I come back from the trip more willing to accept a bit more of that funk factor, as it seems so intrinsic to the wines of the northern Rhone. You could call it an artifact of sweat that goes into growing vines on hillsides so steep. As for the white wines, until this trip, I have under-appreciated them. Generality I prefer crisp, light white wines, and they aren’t. But they are always complex and can possess freshness and often have a generosity that is beguiling. So I come back realizing that some of those Viognier and Marsanne/Roussanne wines grown on steep hillsides are completely unique and sometimes stunning, only needing to be paired with the appropriate dish to be fully appreciated. It’s presumptuous of me to comment on the trends in winemaking in the northern Rhone, but I will anyway. I’m not sure that balance and finesse have been on the forefront of concern in the northern Rhone in the past. The concern was just trying to achieve ripeness, but global warming seems to be affecting the vines here and the growers are seeing that for quality one needs to consider when to harvest, not just be concerned with harvesting before the weather turns bad. At the moment I think the focus has been on capturing the whites at the right moment, since they lose their freshness so quickly if picked too ripe, there is less concern about the reds. But one sees in past vintages that some reds seem to underperform because of a certain flabbiness that comes with too much ripeness. So this trip showed me the question of balance is an issue everywhere, and perhaps I’ve learned also that I can loosen up a bit and enjoy some excessive generosity when it’s given by the vintage. It’s always fun to see how the wine biz works in different places, and what surprised me was how little interaction there is between winegrowers in this tiny region. People keep to themselves and John really stepped out to propose a get together between us California winemakers and the northern Rhone producers we visited. My quick take on vintages is that 2009 was very ripe, with some wines less fresh than I would like–but they are big bombs of wines and easy to enjoy. 2010 and 2011 are fresher and generally great, 2012 and 2014 were difficult vintages, but the good producers made delicate and nuanced wines, 2013 was very good and 2015 made huge, tannic monsters that also possess freshness, so the ones that aren’t overwrought will be stunning in a decade or two. Despite the obvious struggle growing grapes under these conditions, I was left quite hopeful after my visit. 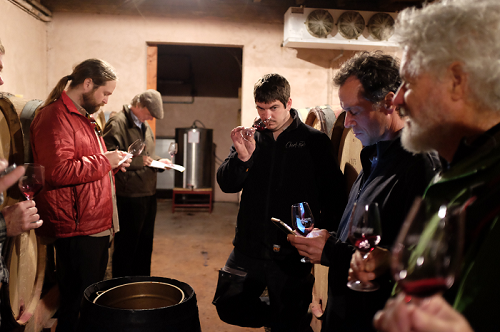 The winegrowers often don’t get the prices they deserve, but they get more than in the past, so you see the next generation actively embracing the life and participating with their fathers, and it’s a thrill to see some of them showing the vitality needed to take their estates to the next level.